If you are looking for a very affordable, but high quality LED TV for your bedroom, kitchen, or some other smaller space, then you should definitely consider this 22-inch LED TV. This small TV from LG is ideal for people who do not want to spend a lot of money on large TV sets, and simply need the basic, but quality TV functionality to watch movies and TV shows. 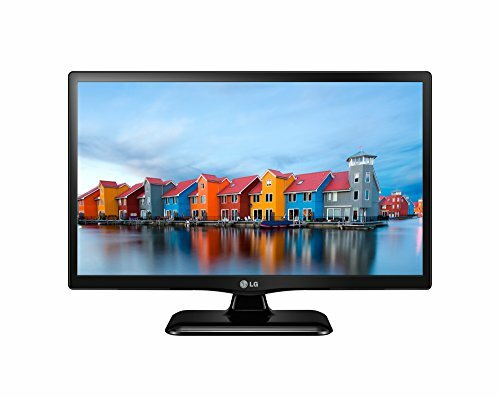 The LG Electronics 22LF4520 is extremely easy to lug around, and comes at a truly amazing price. LG is a popular and strong brand that is well-known for delivering some of the highest quality and most reliable electronics on the market. This manufacturer focuses on producing great and quality products, so if you choose to purchase this TV, you should get an excellent, lasting product. Overall, this great little TV can be an awesome choice regarding the best HD TV for smaller rooms and spaces, as it offers better quality, better sound, as well as better color for the needs of home entertainment. The display panel measures exactly 22’’ diagonally, so this is a very compact TV which probably should not be used as the main and central TV in your living room, but perhaps as a secondary TV or a PC monitor which you can place on your desk, in your office. You shouldn’t automatically consider this compact screen as such a bad thing. Even though you have to be pretty close to the panel when viewing, you will get a higher pixel density, and all the pictures will appear to display extremely sharp. This screen is capable of displaying a 1080p resolution, and 1080p means that your TV set is capable of displaying Full HD resolutions (1080 pixels for the height and 1920 pixels for the width). The images displayed on this screen will appear more natural, and you’ll be able to catch more details while playing games or watching movies and shows. When it comes to image quality of a certain TV, resolution plays a huge role. Getting a TV set that boasts a 1080p resolution is a really important factor if the quality of the content that you are watching is vital for you. This TV is truly small-sized, so it is best suited for some small rooms and spaces, such as an office, a bedroom, or just any compact space. If your main living room is really large, then the LG Electronics 22LF4520 probably should not be used as the main television in that space. The TV set display’s bezel is pretty narrow which helps this TV to retain mostly a minimalist and modern profile. This is a newer TV model, so like most other new TVs this one also sports slim edges that keep its dimensions down to a minimum. This is pretty helpful and handy if you have to place the TV in tight spots. This television set comes with flat panel display. This type of displays have been on the market for a couple of years, and they’re not going anywhere for now. They are integrated in all the latest television sets. They have some great advantages, such as the fact that they are really lightweight so they keep the TV’s profile down to a minimum. Also, the prices of flat panel TVs have dropped significantly over the years, so they have become pretty affordable. The screen on LG Electronics 22LF4520 comes with 60Hz native refresh rate. Refresh rate is utilized to determine how well fast-moving scenes are shown on the screen. The fast-paced scenes in a game or movie will appear better with higher refresh rate. This TV’s refresh rate is more of a usual refresh rate in majority of modern TVs. Of course, it is not high as with some high-end televisions, but for an extremely affordable, 22-inch TV, it is more than enough. You should probably consider getting a TV with at least 60Hz refresh rate, since they show less lagging or ghosting effects than older TV models. This TV does not come with Smart Functionality, so be sure to keep that in mind if you are in the market for a Smart TV. Also, it doesn’t integrate 3D technology, but this is not strange for extremely affordable TV like this one. Usually, the more fancy characteristics and features a TV boast, the higher its price will be. So, if you aren’t on a lax budget, and you don’t care for Smart features or 3D technology, you should definitely consider this great little TV.